Of all the people with epilepsy, nearly 50 per cent have their onset during childhood. Chennai: Epilepsy is a neurological condition that affects brain activity, causing seizures and loss of awareness in afflicted persons. Though the number of cases diagnosed in government hospitals in the state has increased over the years, the potential patients need to be surgically treated remain very low. Birth time problems, brain infections, brain injury and genetic causes are some the common causes of epilepsy. It is crucial to seek appropriate medical attention in case an individual is detected with epilepsy. Epilepsy is diagnosed by carefully analysing symptoms (seizures) to decide if these are indeed unprovoked epileptic seizures. Though neurosurgery, psychiatry, general medicine and pediatric neurology departments in all the government hospitals provide medicinal treatment for epilepsy, not all government hospitals undertake the surgical treatment. The total numbers of cases of epilepsy in Kilpauk Medical College are reported under four departments - Neurology, Pediatric Neurology, Medicine and Psychiatry. There were about 3,128 cases reported in 2014, which almost doubled in 2015 and around 6,804 cases were reported. The cases registered at the hospital in 2016, 2017 and 2018 were 6,640, 7,626 and 7,698 respectively. However, there was no surgical treatment provided to patients. While Stanley Medical College and Hospital sees around 450 patients suffering from neurological issues every month, 30 per cent of them are epilepsy patients. The hospital that sees around 140 epilepsy patients every month, conducted only six surgeries for epilepsy treatment in 2018. “The surgical procedures are undertaken only after medication for about a year. 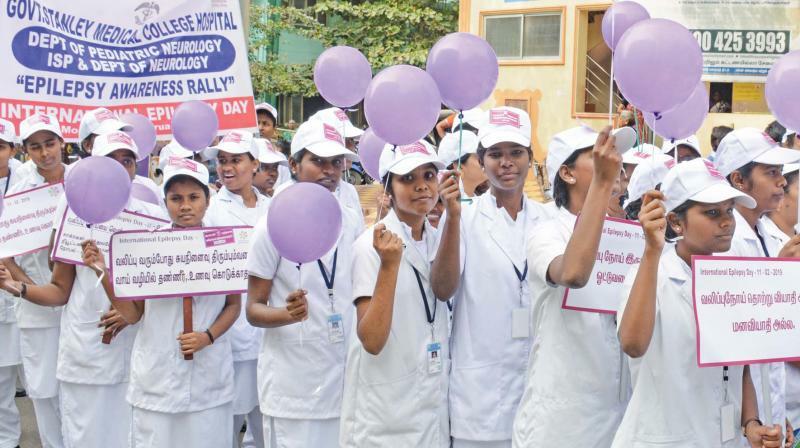 The adults are put on monthly follow up, while children are provided with medicines every fortnight,” said Dr Ponnambala Namasivayam, dean, Stanley Medical College. Of all the people with epilepsy, nearly 50 per cent have their onset during childhood. Around 34,000 children with seizures are being treated in the Pediatric Neurology Department at Institute of Child Health annually. Nearly 2,800 children with seizures get admitted and treated at ICH every year, however, there have been no surgeries done at the institute for its treatment. “The various causes for seizures in children include perinatal insult, neuro infections, neuro cutaneous syndromes, brain malformations, head injury, epileptic encephalopathies. It is very much essential to take anti epileptic drugs regularly. With good compliance and after 2 to 5 years of treatment and being seizure free, drugs can be withdrawn in nearly 70 percent of children with epilepsy,” said Dr AT Arasar Seeralar, Director of ICH and State Child Health Nodal Officer. Tamil Nadu Government Multi-Super-Specialty Hospital sees around 150 patients of epilepsy yearly, but only medications are provided as treatment. Rajiv Gandhi Government General Hospital undertakes surgical procedures for the patients, however hospital authorities say that only five percent turn out to be potential candidates for the surgery out of about 1,000 patients. The cases of epilepsy are more common among children and over 70 -80 percent of patients can be cured and controlled with available modern medications. However, various misconceptions are a hindrance in the epilepsy treatment. “Patients with epilepsy should take the prescribed medications regularly without missing any doses as missing any dose can cause long and severe seizures. One of the common mistakes people do is to stop all medications suddenly to seek treatment with alternative medicine. But such sudden change of medicines can cause potentially life-endangering long seizures called status epilepticus,” said Dr Lakshminarayanan, senior consultant paediatric neurologist and epilepsy specialist, Rainbow Children’s Hospital. “Family members and caretakers need to be cordial, understanding and encouraging in nature. Some of the triggers that lead to a seizure attack are due to lifestyle factors such as sleep deprivation, missing meals, spending long hours in the sun, prolonged computer usage, excessive TV viewing, undue physical or emotional stress. With a healthy lifestyle an individual can reduce the risk of an epileptic seizure attack,” says Dr Prithika Chary, neurosurgeon at Kauvery Hospital. Patients with epilepsy can lead a normal life. There are no restrictions in normal day to day life. Patients with epilepsy can get married and bear children without any problems. However, there is recurrence of seizures in patients with epilepsy is non-compliance with medications. “Not taking good sleep can be problematic as sleep deprivation causes seizures. Taking alcoholic drinks can make the anti-seizure medications ineffective, leading to breakthrough seizures,” said Dr Lakshminarayan K, consultant, paediatric neurology and epileptology, Gleneagles Global Health City.